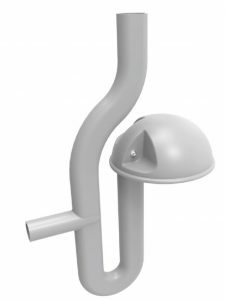 The Surge-flow Dosing Siphon is perfectly suited to gravity based wastewater treatment systems and situations requiring Low Pressure Effluent Dosing (LPED). The Surge-flow Dosing Siphon is installed in a pumpwell following primary or secondary treatment of wastewater and delivers a predetermined flush of water to the Land Application Area. This reduces the risk of classic trench failure by evenly distributing treated effluent along the entire length of trenches and ETA beds. Treatment efficiency is also improved by wetting and drying of the soil. Please call the team on (02) 6621 5123 for more information. We are happy to help with all of your product detail and installation questions.